If the room in your house could talk, what would it say? HELP! It's been 5 years and I still look like move - in day. I'm so lonely! you never bring people to see me. I would love to be part of the family. I know that I'm a weird - shaped room. It's so embarrassing when you need binoculars to communicate with your guests. Instead of spending 20K to tear me down and start all over, can't we just make this puzzle work? "dizzy"! I'm a really comfortable, pretty room underneath this mess. I can't take it anymore! We need help! "Living well and Beautiful ... are all one thing." Sshhhh! Close your eyes and imagine your furnishings like a forgotten masterpiece brought to life. Breathe new life into this familiar picture without spending a cent. 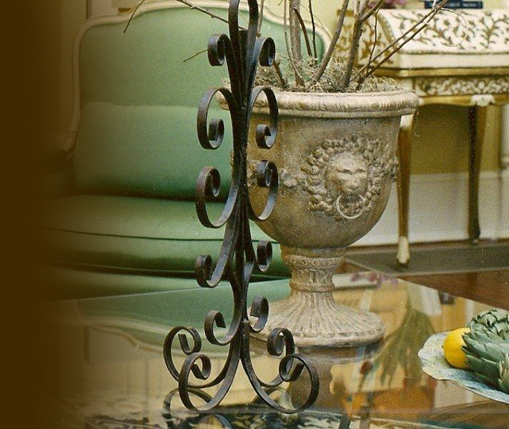 Familiar Elegance is an interior decorating service that uses existing furnishings, art and accessories that you have collected, inherited, or purchased for years to create a new look in just one day. Marjorie will inventory your house by using treasures from other parts of the house (will get permission first). At the End - "Wow! Is this the same room?" "Focus on what's there ... not what isn't"
"Absolutely astonished. Surprised with the layout of the furniture and how much better my things looked. She listened, she designed, she achieved." "Amazement -it was out of a magazine. What surprised me the most - the warmth. Marjorie achieved just what I wished for. Having my husband like it was an added bonus. 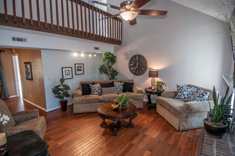 "After hiring Familiar Elegance to redo my living room and bedroom, within 2 days I went from frustration in my home to extremely proud to open my home for entertaining and any occasion for family or friends to gather for special times together and I also find myself spending more time with family. It is now a very comfortable living arrangement - it reflects our taste and lifestyle. Love it."